Wyoming’s Beartooth Mt. Ascent Program was created to develop the minds, bodies, and souls of the troubled young men in our care. Through active involvement in the program, they’ll learn to observe, listen, and communicate with the horses they’ll be working with. At our ranch, horses and good horsemanship are an essential reality in the life cycle and care of our large herd of Angus cattle. From their birth, to the selling of yearling steers, Beartooth MT Ascent students will assist in the working of the cattle with the aid of their horses and a traditional cowboy spirit. The Ranch at Beartooth Mt. Ascent is home to thirty-five head of horses used primarily for ranching purposes. Each of them plays an integral role in our traditionally styled ranch life. We take pride in the herd we’ve built. Like the young men at Beartooth MT. Ascent, the horses in our care come from differing backgrounds. 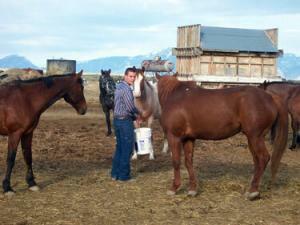 Our herd consists of Quarter Horses, Arabians, Paints, and Mustangs. Some of the at-risk youth have never been close to, or may have never even seen a horse. 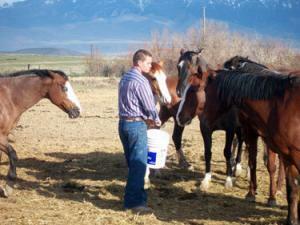 By the end of their stay, the young men will have learned how to feed, groom, and care for the horses. The experience of this close contact with them is known to contribute greatly to each young man’s healing process. It’s incredible to see these teens pick out their favorite horse amongst the whole herd, and quickly bond with them. However, in our horse program we don’t allow just one horse to be ridden continuously be only one person. As is true with the old horsemanship philosophy, many horses make a horseman. Each horse will bring a different set of challenges for the young men. Their connection may be instant, or they may struggle with certain horses to work together as a team. It’s a chance for them to realize that not every relationship or new experience in life will be easy to navigate. It’s through their resilience, discipline, and ability to listen to themselves and the horses that will help them succeed. This philosophy of working with horses by appealing to their herd instincts. It involves communication techniques derived from wild horse observation in order to build a partnership that closely resembles the relationships that exist between horses. It’s based on a genuine respect and love for horses, and a want to understand horse nature and psychology. Horses are social herd animals. And because of this, the horse has a highly developed communication system practiced primarily through non-verbal communication. Their way of communication evolved for social interaction and to evade their predators. Most importantly, horses look to the leader of their herd for protection and instruction. Horses are quick to escalate a behavior if early warnings are not heeded. Similarly, in natural horsemanship, the handler or trainer uses body language along with other forms of gentle pressure with increasing escalation to get the horse to respond. Horses are quick to form a relationship of respect with humans who treat them in the fashion of “firm but fair”. The goal is never to make a horse learn or react in a positive way, it’s to let them. Learning without fear. Most horsemanship practitioners agree that teaching through pain and fear does not result in the type of relationship that benefits both horse and handler. You want the horse to feel calm and secure throughout the training process. A horse that feels safe and looks to you as a leader is quick to bond with that person, and the results can be remarkable. Respect and trust are a two-way street. If the teen learns how to train with both respect and trust as his goal, the horse will show him the same. Fear should never be used as a tool to make a human’s life easier. Understanding natural instinct. The human must be knowledgeable of the horse’s natural instincts and communication system, and use this knowledge in their work. Horses are fight or flight animals, meaning their natural instinct is to respond to any given situation by fighting it head on, or quickly leaving to ensure their survival. Horses do not respond to intimidation or threats, they respond to clear communication of respect, consistency, and leadership. Only when a person learns to communicate in this language will he become a trusted partner. With a general understanding of the why behind a horse’s mentality, it is possible to learn the basic principles of this method. It can be summed up in four words: Relationship, Understanding, Communication, and Trust. A healthy relationship always begins with understanding. In this case, each person handling a horse must remember that a horse is fine just the way she is. That horse doesn’t need you on it’s back. And they certainly don’t need to do everything you ask of them in only the way you ask it. In any case, you’re not working on the horse, you’re working on yourself. 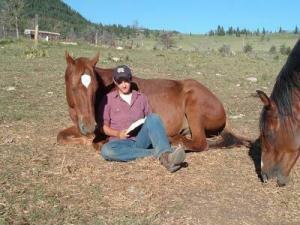 It’s the human in the human-horse relationship that has to learn how to relate naturally to the horse. The method teaches you how to work with a horse in the most loving, effective and efficient way possible for lasting results and success. This is why, at Beartooth Mt. Ascent, we do not recommend that the troubled man ride our horses while he makes his initial adjustment to the first phase of our program (this is often taken as long as a month). We are not a “dude” ranch, and developing a good relationship between horse and human consists of serious trust, work ethic, self-motivation, and a sense of responsibility. These key factors in behavior improvement aren’t always something a teen is ready to commit to just as they come into our care. Determining the young man’s progress after the first phase in the program will tell us if he’s ready to become closely associated with a horse. Caring for and riding a horse has many responsibilities attached to it. It requires many hours of study and a desire to learn about horses. The slower the work, the faster they’ll learn. When the student demonstrates that he understands the theory behind a meaningful relationship, we’ll know he’s ready to take on the wonders and hardships of the natural horsemanship method. Horses are prey animals. Pretty much everything they do or don’t do is based on their survival instincts. Seeing the world from the horse’s point of you. This includes figuring out “what’s in it for them” when asking something of your horse. Understanding your horse’s basic personality type. This is so you can work with the horse in the most effective way possible, given their particular psychology. Much of natural horsemanship relies on understanding and learning to work with your horse’s personality including both his positive and negative traits. This teaches students how to “read” their horses and incorporate the best strategies for managing behaviors and achieving success. At Beartooth Mt. Ascent, the troubled teens learn the most effective methods of communicating with the horse, and it all begins with understanding. This will translate directly into how they communicate with the people in their lives. The students learn from the horse very quickly how their non-verbal communication is translated, and how timing in that communication is everything. Horses cannot be manipulated or lied to; they’ll “see right through you”. 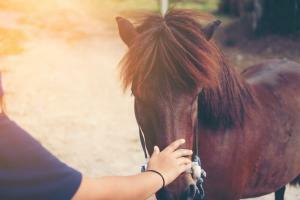 Our Equine Specialist has spent years keenly observing horse communication systems, how relationships were established, and how trust and leadership are developed. This enables our staff to teach people how to communicate with and relate to horses using horses’ own natural communication methods. Putting the relationship with the horse first. Learn to communicate in the horse’s own language. Establishing a good relationship on the ground before you attempt to get on his back. The respect a young man wishes to see in their horse can only be based on well deserved trust. The programs and therapies listed on our website are aspects of our daily life on a working cattle ranch, and are integrated within our main Beartooth Mt. Ascent program. Students participate in the daily ranch activities that are an organic part of real ranch life and work. Students do not get to pick and choose what activities they want to do each day. This teaches a young man to go beyond himself, become part of something bigger than himself, and learn to do what is required and needed. It’s not about only doing what he finds pleasing to himself. Not every activity listed is offered every day. Many of these activities are available only when the season or weather permits. During harsh winter months we do not ride our horses on a daily basis. It is hard on the horse and the rider, and can be dangerous when the grounds are icy and frozen.